Are All Custom Rocking Chairs High Quality? Top quality custom rocking chairs offer far more than what meets the eye. The highest quality custom rocking chairs are made with good materials, long lasting joinery, and a durable finish. 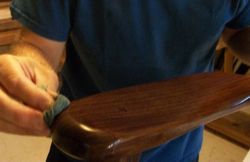 First, a strong wood is critical for the proper functioning of custom rocking chairs. Stresses are extremely high on this kind of chair (because of the repetitive tilting motion and shifting of weight) and must be countered with the best materials. Not only that, but the orientation of the wood grain has to be considered as well. 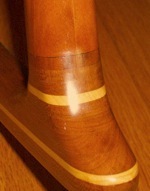 The legs, seat, back slats, arms and headrest must have the grain direction in a parallel orientation to the longest dimension of the piece, (as seen in the cherry arm rest shown above). For example, the grain must run along the length of the arm not directly across it. Otherwise the piece can be easily broken. You can find more about this by clicking on the Materials Selection tab. Secondly, strong joinery makes the difference between a beautiful rocker and a pile of sticks. The photo at right shows how a really good joint is tight and strong, built to last through the years. Examining a chair closely will reveal just how much care was put into its assembly. There should be no squeaks or groans when rocked, even when a 6'5", 352 lb. lineman with his 65 lb. son plop down in it and rock for half an hour! Click here to learn more about the importance of joinery. Finally, a really good finish (like this oil and varnish being applied to walnut) does much more than just protect the surface of the rocker. The best finish greatly enhances the beauty of the wood while not appearing like a thick, "plastic" coating. Experience has shown that a top quality finish needs to be tailored to the specific use for the rocker. One kind of finish does not cover all the bases, so to speak. For more information about how a top notch finish is created just for you, click here on the Finishing Process tab.